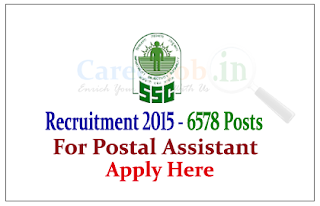 Staff Selection Commission has published recruitment notification for Combined Higher Secondary Level Examination,2015 for the post of Postal Assistant, Data Entry Operator and Lower division Clerk for the year 2015. Eligible Candidates can apply online on or before 13th July 2015. 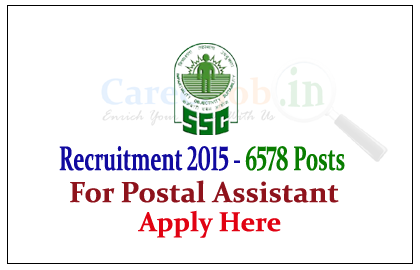 Staff Selection Commission (SSC) was established in 1977 under resolution number 46/1/(S)/74-Estt. (B) dated 4th November, 1975. The mandate of the Commission is to conduct examinations. There are Nine (9) Regional Offices / Sub-Regional Offices of the Commission to assist in the conduct of examinations. The Eastern Regional office of the commission is located in Kolkata and has territorial jurisdiction over West Bengal, Orissa, Jharkhand, Sikkim and the Andaman & Nicobar Islands. Government Sector / Central Govt. Eligible candidates can apply online on or before 13.07.2015 with, For more details kindly check official Notification. Skill test / Typing Test on the basis of their performance in the Written Examination.